To expand into new markets, the Burton upon Trent plant in the United Kingdom recently introduced a new line of speciality steel and stainless steel drum types. The UK facility has a long history of producing UN and non-UN stainless steel drums. This product line has now been expanded to include both tight head and open head drums in sizes ranging from 5 litres to 250 litres capacities. The expanded product line means Greif can offer more to the food and beverage, pharmaceutical and personal care, and flavours and fragrances industries. Innovating to better meet customer needs, the Burton team also created a UN certified ‘T’ marked salvage drum, suitable for both solids and liquids. 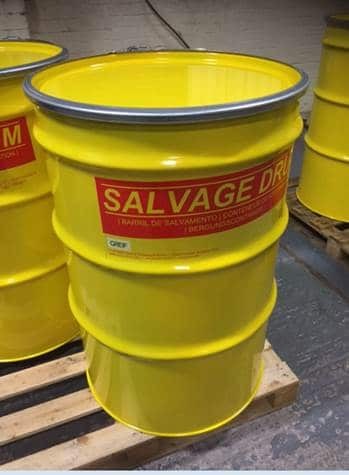 The new salvage drum, introduced by Greif UK in December 2016, provides a significant improvement over the previous overpack drum offered to the market. One key feature of the new product is that the external finish of the drum is powder coated to ensure the product is extremely durable, has high resistance to external corrosion and remains service-ready in all conditions. The product was developed by the team led by Jack Robinson, Engineering Group Leader for the plant, and was developed and extensively tested, using the services of Greif UK independently-accredited UN test facility located at the company’s Ellesmere Port plant. “We are constantly seeking new ways to partner with our customers to help them grow the business. That drive coupled with our commitment to continuous improvement, led to an innovative line of new products. If, as a customer, your application demands high end packaging suitable for containing a high value product and protecting it under the most demanding transport conditions, Greif has you covered,” said Robinson.